The food and beverage industry is under close and constant scrutiny by regulators more so than any other industry because of the nature of the products that are being produced at its facilities. Cleanliness and product purity are essential when processing, cooking and serving food, that is why it is of the utmost importance that all concrete floors are covered with a durable, protective coating to ensure product quality and to eliminate the chance of possible contamination. Choosing the right floor coating will not only have an impact on the facility but also on the product, as well. When selecting the floor coating for the food & beverage industry, one of the most important factors is the need to comply with government agency requirements on both the federal and state level. Among the issues that are routinely checked during inspections, one of the most important is the floor coating, which must meet or exceed certain standards set by the U.S. Department of Agriculture, USDA, NSF and the EPA. This reason alone makes it crucial to employ a company like SealWell to provide a seamless, hygienic floor coating system that can withstand constant moisture and bacteria from food byproducts. It is also essential to choose a coating that is durable and thick enough to create a protective barrier that prevents contaminants from permeating concrete, providing a hygienic surface. The flooring of a processing plant, commercial kitchen, and even a restaurant are constantly being exposed to all sorts of food by products including fats, hot oils, blood, sugar solutions, and natural food acids. These substances can erode and infiltrate uncoated concrete, resulting in uncontrolled growth of bacteria, potentially contaminating and degrading the quality of any food products that are present. 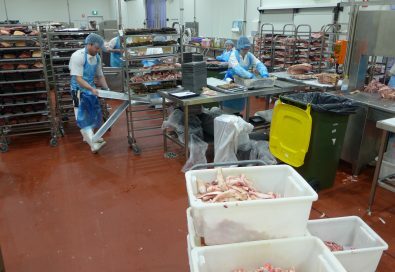 Food processing plant operators, in particular, are faced with the dilemma of implementing hygienic surfaces across a variety of plant areas, all with differing corrosive conditions, such as dry storage areas, cold storage rooms, and mixing, canning and slaughtering areas. This makes the type of floor coating used by far one of the most important product specifications a food processing plant manager can decide. A popular choice for flooring applications within the food industry is polyurethane mortar or cement due to their durability. Floors in a food processing facility must be thoroughly cleaned on a regular basis, often several times a day and they must be durable enough to handle vigours cleaning procedures. Polyurethane cement combines the most demanding performance characteristics including resistance to impact, abrasion, aggressive chemicals, strong cleaning agents and thermal cycling, making it a perfect high-performance floor coating choice for food and beverage facilities. For areas where both cleanliness and durability are crucial, polyurethane cement flooring systems deliver a more durable floor coating that can offer sufficient protection to meet government regulations and standards. If you are looking for the most durable, high-performance food and beverage floor coating options then contact Sealwell today at 1-844-443-2844.